“A Fighter Pilot’s, Fighter Pilot” Wait till you get ‘em right in the sights, then short bursts. There’s no use melting your guns.” In his book Gabby: A Fighter Pilot’s Life, Francis “Gabby” Gabreski spoke about going to war after the bombing of Pearl Harbor, December 7, 1941, “This was it. War was on, and I was going up to do my part. I took it for granted that we probably would be getting into combat. Maybe I would shoot down an enemy plane. Maybe I would get shot down myself. I didn’t expect to be killed, but I’ll have to admit the thought crossed my mind. It didn’t matter. The main thing was to attack the enemy.” Due to the confusion on the ground, the Japanese were gone by the time he got in the air in his P-36. In 1942, inspired by the Polish pilots who were helping the British fight the Luftwaffe in the Battle of Britain, he had an idea. If he could get himself stationed in Britain he could help, after all, he was a Polish/English speaking pilot. With some effective persuasion, he was promoted to Captain and assigned to the Eighth Air Force in England. After arriving he met some of the Polish pilots and was given temporary duty with their No. 315 Squadron, flying Supermarine Spitfires. He was awarded the Polish Cross of Valor for his exceptional work. On July 5th, 1944, Gabreski became America’s top “Ace” in the European Theatre with 28 victories(1). 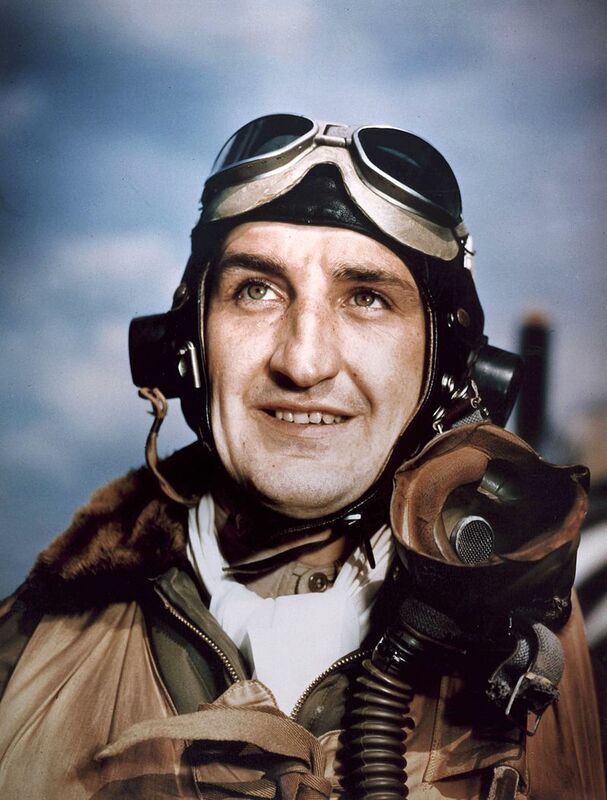 Captain Gabreski left the service after his British tour and went to work for Douglas Aircraft. When the independent United States Air Force formed in 1947, he reentered the military and returned to the 56th Fighter Group at Selfridge Field. 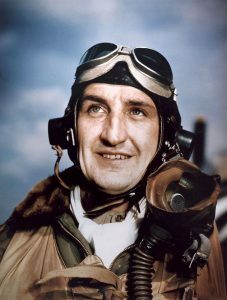 With war erupting in Korea in 1951, Gabreski reported for combat duty as Commander of the Fourth Fighter-Interceptor Wing, Korea. In July 1951 he scored his first victory in and in the next few months added two more. The growing MiG threat against Boeing B-29 Superfortress bomber attacks near the Yalu River caused the Fifth Air Force under Gabreski’s command to create the 51st Fighter-Interceptor Wing and move from F-80s to F-86s in a 10-day period. Gabreski introduced the ideas of a “flight of four” and “hot takeoffs” to increase combat effectiveness over targets. These innovations were highly successful and his Wing attained a 14 to 1 kill ratio (2). It wasn’t just about the war for Gabby. He was a deeply religious and compassionate. When he heard about a Suwon, South Korea orphanage operating in deplorable conditions, he appealed to the citizens in his hometown in Oil City, PA for help. His plea was answered with medicine, school supplies, clothing, and building materials. On April 7th, 1951, Gabreski became an Ace in Korea with 5 1/2 victories. After one more victory his combat days ended and he arrived home to a ticker tape parade. In 1954, after serving as an “ace” pilot in both WWII (28 kills) and the Korean War with a total of (6.5) kills, Gabby attended the Air War College at Maxwell Air Force Base, AL for a year, transferring to command a tactical fighter wing at Myrtle Beach, S.C., that was being equipped with supersonic North American F-100 Super Sabres. The aerial refueling capability of the F-100 and fighters like it enabled the Air Force to quickly send reinforcements to trouble spots around the globe. Gabby found that in-flight refueling required special training, and after flying a number of such missions, described them as “a dramatic experience.” He said later, “I would rather attack a squadron of Fw-190s alone in a P-47 than face one of those drogues again in an F-100. That was nightmare fodder.” He retired from the Air Force on October 31, with 27 years’ service. Although best known for his credited destruction of 34½ aircraft in aerial combat and being one of only seven U.S. combat pilots to become an ace in two wars, Gabreski was also one of the Air Force’s most accomplished leaders. 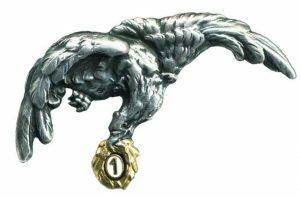 In addition to commanding two fighter squadrons, he had six command tours at group or wing level, including one in combat in Korea, totaling over 11 years of command and 15 overall in operational fighter assignments. In 1967 Grumman Aerospace Co. offered Gabby a job as a marketing vice president. He left Grumman to become the president of the Long Island Railroad in 1980-1982, a commuter railroad owned by the State of New York, and struggled in his attempts to improve its service and financial condition. He then went back to Grumman and remained employed there until his retirement in 1987(3).